Since the beginning, we have been intensely focused on delivering your natural fit through our comprehensive 28-Point Fit Profile. Our Master Tailors review each set of new measurements and create a unique customer template. We carry the latest seasonal collections from the finest mills in the world, including Scabal, Zegna, Loro Piana, Dormeuil, and many more. 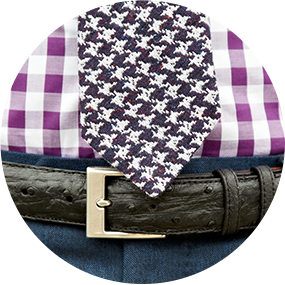 Your ability to personalize the style of your garment is limited only by your imagination. Our Professional Clothiers will guide you through the entire creation process until you arrive at your style and your price. Each suit is hand cut, then sewn together according to our strict quality standards and delivered to you in person. 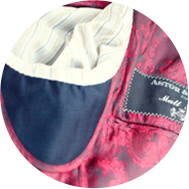 gathering the information needed to deliver a garment worthy of Astor & Black’s standards. First, our Professional Clothiers will schedule a consultation at a time and location that’s convenient for you. They’ll want to understand your current wardrobe, lifestyle needs, and style preferences. Profile—including measurements, pictures, and notes—that our Master Tailors will use to create your custom clothing templates. 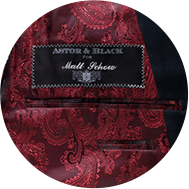 With thousands of name-brand fabric options and personalization choices that are limited only to your imagination and your personal sense of style, it’s good to have an experienced Astor & Black Professional Clothier by your side. Together, you will explore the endless possibilities and create entire looks that have one purpose in mind—to make you look your absolute best. When it’s time to construct the custom looks you created with your Clothier, our Master Tailors use the measurements, pictures, and notes from your 28-Point Fit Profile to create an original template for your garment. Your selections will come together in a garment that delivers a natural fit unlike anything you’ve ever experienced in clothing up to this point. When we deliver your custom clothes and you put them on for the first time, you’ll immediately understand—the wait is worth it. Sometimes, there are adjustments that need to be made in order to get the fit dialed in. If there are adjustments, we will take them to our local, pre-qualified tailors and then re-deliver your clothes when they’re ready, ensuring the fit is just right. All of our suits come standard with these features at no extra cost. 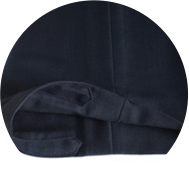 All Astor & Black garments have reinforced stitching on the underside of the jacket collar. Our tailors add these five layers of stitching to prevent the collar from ever rolling and to keep it sturdily flipped up when protecting you against the cold or revealing contrast felt and embroidery beneath the collar. Hand-picked stitching refers to the small and unobtrusive stitching that runs along the lapel, the edge of a jacket, and sometimes around the pocket flaps. It’s a classic feature of a high-end jacket and a clear indicator that you’re wearing a handmade garment. Look for its close proximity to the outer edge of the garment and its variation both in stitch length and alignment with the adjacent stitch — all clear indicators of custom handwork. 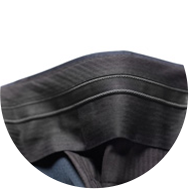 In the underarm section of every Astor & Black jacket, you will find a sweat shield, which, as its name implies, shields the suit from perspiration and odor. Thanks to our 28-Point Fit Profile, each of your Astor & Black suits will fit you like no other suit possibly could. Your suits will fit better over time as the hand-stitched assembly stretches and the fully canvassed construction breaks in. Our suits actually conform to your body, unlike off-the-rack and made-to-measure, which are machine sewn and fused together so tightly that they never give in. 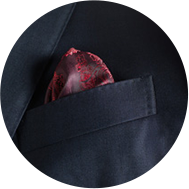 The breast-pocket lining of each Astor & Black suit jacket doubles as an impromptu pocket square. Made from the same material that lines the jacket, all you need to do is reach in and pull it out. Instant cachet! 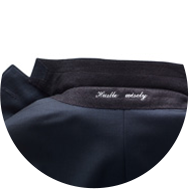 When you take the time to create something as personal as your Astor & Black suit, you’ll want your name on it. So we embroider your name on the labels that adorn the inside of your suit jacket and the inner waistband of your pants. 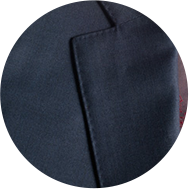 Jacket linings are the best way to reveal the personalized style of your suit. 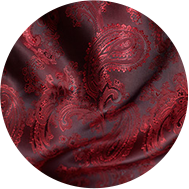 At Astor & Black, we carry hundreds of silk jacket lining options with everything from a full spectrum of solid silk colors to daring prints, like an abstract paisley or a motif of 1940s-style pinup girls. 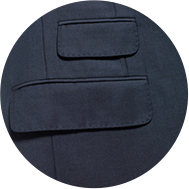 The term “surgeon’s cuffs” refers to the functioning buttonholes found on all Astor & Black jacket sleeves. 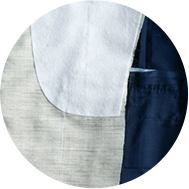 Working buttonholes imply that the jacket sleeve length is unalterable and therefore possible only on a custom garment. 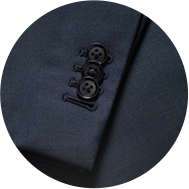 Should you decide to flaunt it, leave the last button undone and select a different thread color for that buttonhole. Bold! 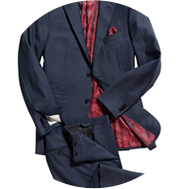 We want your suit to last a long time, and once you put it on, you will, too. 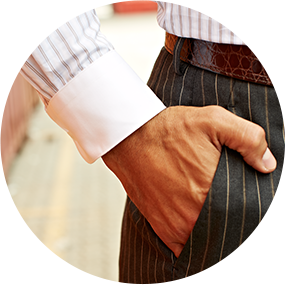 So we’ve addressed one of the most common wear-and-tear areas—the back of your pants cuff. This area is subject to a lot of friction as it moves against your shoe. Our answer? 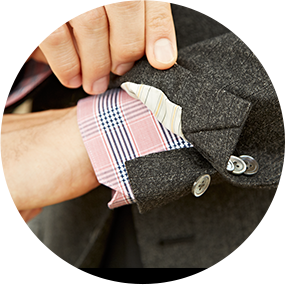 Guard the hem with an extra strip of material we sew on the inside back side of the cuff. A suit’s inner canvas lining is what gives the suit its shape and form. A full-canvas garment lasts longer, breathes better, loses its wrinkles quickly, and allows for more natural movement and drape because its hand-sewn layers can move independently of one another. All Astor & Black suits are tailored with our signature lightweight canvas from Italy. With the assistance of your Professional Clothier, you have a wide variety of suit style options to choose from, including 17 different jacket styles, 14 coat features and pocket configurations, and six different pants styles. Astor & Black trousers have a stiffer, thicker waistband that is reinforced to prevent rolling so they look great without a belt. You will also find a rubberized strip around the inner waistband to keep your shirt from untucking or moving around.